* How long will it take - Roof replacements take from one (1) to three (3) days. * How much does it cost - local single family homes range between $4000 - $9900. We pull out the nails holding the damaged shingle. Remove both the nails and the shingle. 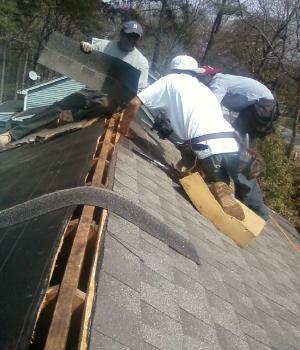 We replace the damaged shingle with one similar in weight, size and color. * How long will it take - less then a day. Architectural style shingles are an exceptional upgrade over the typical 3-tab shingle. They are a laminated shingle composed of an extra layer of asphalt and granules. They are much thicker than the standard 3-tab shingle and have a more three dimensional look that resembles wood shakes or slate. And they add a very nice accent to the look of your home. They are available in 30-, 40-, 50-year or limited lifetime warranties. Shingles are the most popular style of roofing for residential buildings. They are also the most cost effective. Composed of both asphalt and fiberglass, they are available in an assortment of colors, brands and styles. include GAF-Elk's patented High Definitionâ color blends and are stylish and practically priced with an outstanding 30-year warranty. Questions? For Atlanta GA handyman services call us 678-977-4940 or email us your question. We are a local company that repairs and replaces entire roofs. relationships with our customers. We provide free estimates. Call Today! Snellville, Dacula, Atlanta, Sugar Hill, Auburn, Monroe, Stone Mountain, Conyers, Grayson, Smyrna & Lawrenceville. pressure washing, fences & fence repair, window repair & installation, screen doors & decks.